When there is a food memory, it is usually long-lasting. Facts – whether physical, chemical or biochemical – rarely play a role; rather, the remembrance links to an experience that takes place while the workhorses of the body, namely enzymes, convert carbohydrates, proteins and fat into energy. Years later we likely recall the emotional essence of the situation. We may think that it was the extraordinary smell, flavor or texture that impressed us, but when trying to reconstruct the physical sensation in the mind, it is futile. A sensual relationship with dead matter, which even the most delicious combinations of starch, sugar, butter, pulses and plants offer via the nose, tongue, eyes, skin and ears, is a flickering experience. Until there is interaction between two or more living beings that accumulates a feeling, the impact remains meager; therefore, a larger context always surrounds the most vivid recollections. Food is the proxy that triggers them. When I went to India in 1993, I got very sick after drinking impure water from a bottle I bought outside the Kolkata airport on my way to Delhi. Although I noticed the seal was broken, I couldn’t resist drinking while dehydrated due to the scorching weather. After the first sip, I regretted: there was no return from being accompanied by a stomach pain for the rest of my trip, and even beyond it! While visiting the temples and kundas (water wells) in Vrindavan and Mathura area, local residents eagerly served me either sweet-rice or gulab jamun which I could not refuse although I was well aware the treats would pass through me faster than I could run back to the ashram I was staying in. Then, within a week or two, I was able to walk only to a cement-walled toilet outside the room I shared with a transparent gekko on the ceiling. Ever since – regardless how fondly I remember every saintly person I met and the soft mist through which I could hear jubilant greetings “Radhe, Radhe!” long before the sunrise – I have politely stayed away from sweet-rice and gulab jamun which, with all fairness, didn’t even cause the discomfort that finally bound me to a hospital bed. 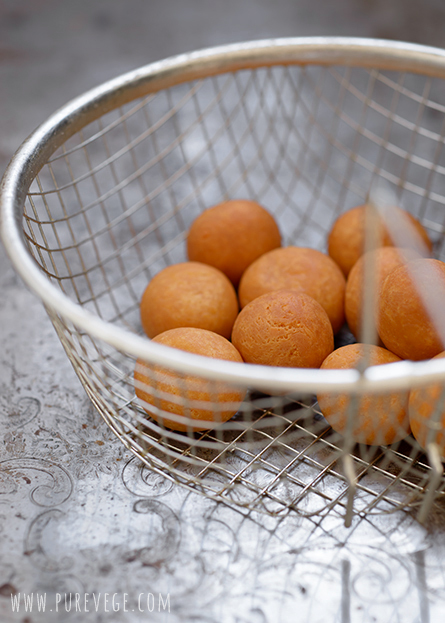 When my husband was a brahmacari, a celibate student in a monastic setting, gulab jamun were closest to a direct sense-gratification he indulged during the festival days with his friends. They used to make them from milk powder in such a way that they soaked sugar syrup like balloons and exploded in the mouth. Everyone got intoxicated by the amount of sugar! When he went to India a year or two before me, he travelled by train from a holy place to another and stayed in dharmasala or rest-houses for pilgrims that were far from five star sanctuaries but often resembled animal-shelters without any basic facilities. Although spiritually rewarding, it was austere. It didn’t help that the airline company had lost his luggage on the way to India and he could afford only to a pair of dhoti (loincloth) and chaddar (upper garment) he washed daily. On the top, a monkey stole his eye-glasses in Vrindavan! You can imagine his anticipation when he arrived to Jagannath Puri, a famous coastline town by the Bay of Bengal, and bought one gulab jamun from a vendor outside the temple. He likely thought it will compensate the hardship of being pushed around in the crowded trains and taking cold showers from a bucket in the early hours, only to be utterly disappointed when popping the sweetmeat in the mouth. It wasn’t anything like the soft, juicy bullets that had pampered him in the ashram; rather, it was hard like a stone. During our twenty years of marriage, I have made gulab jamun once before the past few weeks. Interestingly, it was an uneventful occasion fifteen years ago which I, however, remember clearly; probably due to the initial experience I had in India. I was surprised then, like I am now, how attractive dessert it makes. Yet, I’m not eager to make them again anytime soon! In order to satisfy my husband’s food memory from the brahmacari years, I had to make several batches of gulab jamun to get them right. It was my understanding that you have to cook them slowly in ghee over a very low heat, but I learnt that it makes them more solid and, thus, unacceptable by our Polish connoisseur! To make them hollow inside, use fat-free milk powder, a pinch of baking powder and enough milk to quickly tie the ingredients together. Then, roll small balls from a marble size up. When fried in ghee over a moderate temperature, they double or triple by diameter. This type of gulab jamun are not the prettiest because they dent in syrup, but if you are going for a sugar rush – nothing beats them! Expect fireworks in the mouth! I achieved the second best result by using milk powder with 26% fat, a pinch of baking powder and a little bit of milk. Fried fairly quickly over a moderate temperature and soaked overnight in thin syrup, they became spongy and succulent. 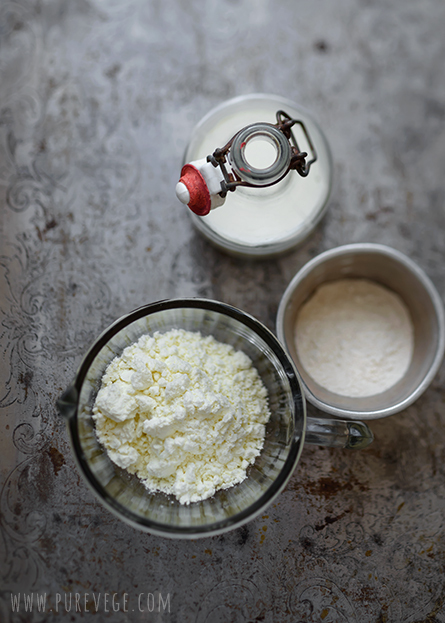 Adding a teaspoon (or two) of flour into the milk powder helps the balls to retain a perfectly round shape and prevent dumplings from collapsing when plunged into the syrup. 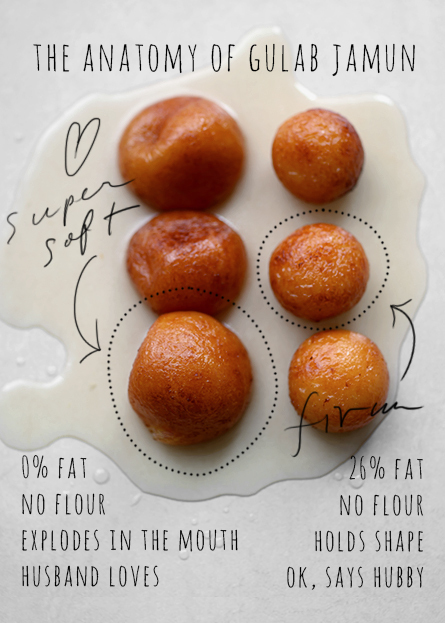 However, in our test kitchen, these types of gulab jamun were least favored. The flour appears to reduce the flavor. I made one serving using organic whole cane sugar in the syrup; it wasn’t a good idea because the taste was over-powering. 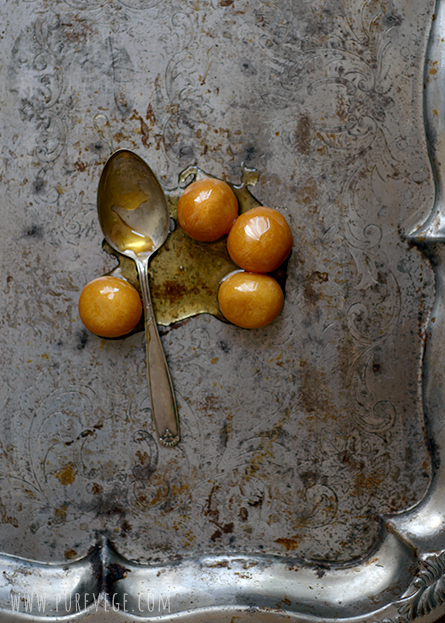 Gulab jamun are subtle and sophisticated sweets. Nothing that is fried in ghee and imbued with sugar becomes “health food” by any trick. 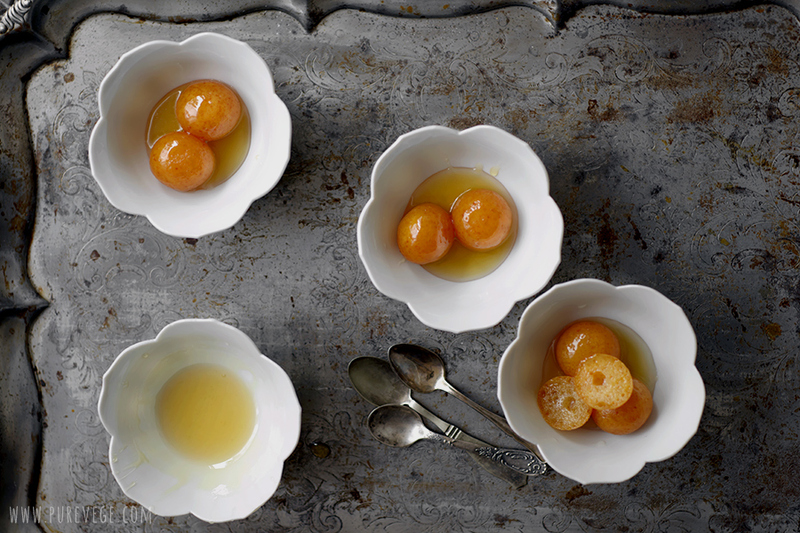 Traditionally, gulab jamun are made from milk solids, known as khoya. Cardamom, saffron, rosewater or kewra-water scents the syrup. The Mughals likely introduced the sweet to Indian Subcontinent and its origins are in Persia, as the name, “flower water”, indicates. There are many similar Arab and Turkish desserts. Even the Greek loukoumades, although spiced with cinnamon and honey, seem to sprout from the same root. Although my husband and I have now created a new gustatory memory around gulab jamun that is quite different from what we experienced before we were married, it doesn’t override the original ones which, in spite of being connected to sickness and severe penance, have a special place in our hearts. In fact, the present remembrance preserves a link to where we came from and helps us to revisit all that is important to us today: our friendship and the search of sacred we are committed to complete together. This is such a neat, unique, recipe! I love the looks of it! It is amazing what you can do with just a few ingredients. That's the genius of cooking! Magnificent! 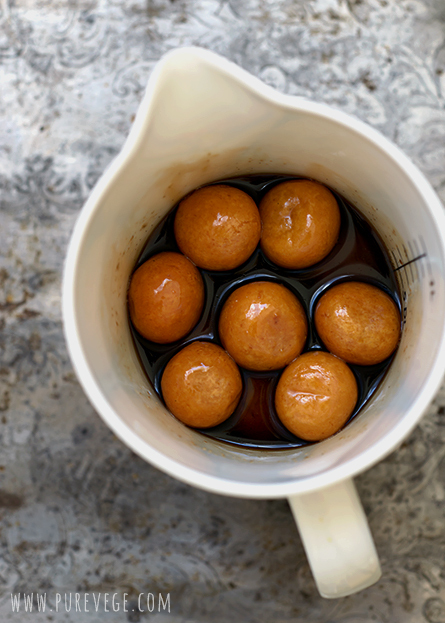 Your gulab jamun must taste heavenly. Yes! Stay away from water which is not properly sealed in a bottle. :) I love gulab jamun but do not make them very often. The deep frying and then soaking in syrup freaks me out a little bit. Beautiful pictures. I can almost visualize your stories. From the transparent gecko to the over crowded Jagannath temple in Puri. Yes, deep frying and sugar syrup freak me out, too! That's one reason I haven't made them, although they taste lovely. In an ideal world, you just take one or two after a meal, but in reality, you always end up eating too many of them :-)! Oh dear, I can sympathise with you. I had once the same experience with water, but in Egypt. Due to that I had an unforgettable diving lesson :) The sweets look neat and divine. It reminds me of Turkish sweets, but anything so overwhelmingly sticky makes my stomach tremble after two bites. Poor diving instructor :-)! He/she probably made a career change after your lession :-)! Vera, you are right - one or two bites of these sticky babies are enough for a normal person. I like gulab jamun but seldom make them. There's a similar Bangladeshi sweet called "kalojam" or "kalajamun" which is what I usually make. Kalojam is bit darker(fried little more) and made of fresh chana(riccotta) instead of powder milk. Your photos are gorgeous. I would love to taste gobble one. Even gulab jamun are usually a bit darker. For some reason I prefer them light. It is the natural sugar in milk that gives the color when in contact with hot ghee/oil. If I'm not mistaken, sometimes sugar is even added to kala jamun (to chana) which makes them further darker. I'm with you. I prefer the lighter colored ones as I find them less sweeter than the darker gulab jamun. As for kalojam, a little sugar is added to chana. Lakshmi, I love love gulab jamun! Will be trying your recipe soon for sure :) Thanks for sharing! Indulge is the word for these isn't it? First deep fry and then in sugar syrup :) And to think that those trays in those hundreds of sweet shops are packed with these and are usually gone by night. I cannot imagine how much the Indians indulge. I usually settle with one tiny one or maybe two at a time, but the husband is another story! It is scary to see him eat. I am just thinking of your husband seeking solace in a gulab jamun after the dharamsala and the encounter with the monkey! I know I should not but I am laughing... those monkeys are quite smart creatures. Interesting to note the difference with and without flour. I added a some flour to my sweet potatoes as I thought they would disintegrate without it, but they still dented a bit in the syrup. But I can imagine how the imperfect ones would be just melt in the mouth. The use of fat free milk powder is interesting! I guess it would make them lighter on the stomach too. Can't get enough of your photos. 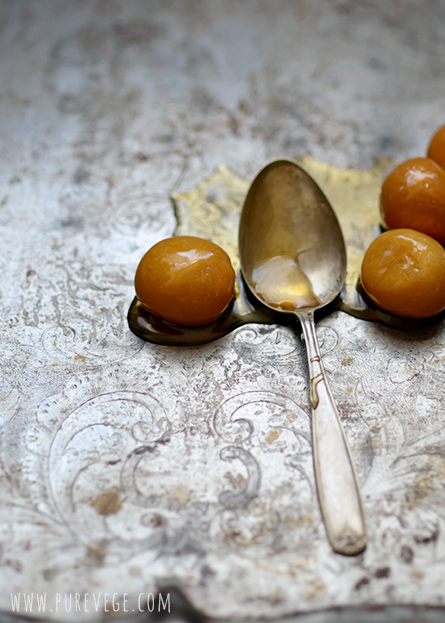 Funny, last week I was also cooking and photographic gulab-jamus for my blog. And lso as a polish wanted to show two version of it. Have the same backgroud as your husband- and for me gulabs must to be soft and juicy. Altough during years I learn how to cook firm and solid gulabs- which " rest of the world" apreciate more than "polish ones". Nice to see you publising regular now. Beautifull photography as always. Are there any news on your book? When it will be on sell? I can't wait to see it. i tried making them once but it was so stiff and the syrup didnt get all the way through it. living it Dallas, its easier to just get it from a store near by but again i can see total gratification making them from scratch. Beautifully captured Lakshmi , Jamuns looks super perfect and totally enjoyed reading your post !!! This is one of my favorite Indian sweet :) looks surely divine !!! Wow mouth watering!! your comparisons with fat is really good. My son's favorite sweet. Hi Lakshmi. I was a little scared to try your flourless recipe...I tried using Yamuna devi dasi's "beginners recipe" (http://backtogodhead.in/cooking-class-lesson-35-by-yamuna-devi/) as it uses a bit more flour...and should have been more fool proof. They ended up breaking in the ghee! The few that managed to stay whole, went flat in the syrup. Any ideas why I've had this complete failure? Sorry to hear, Nicole! As far as I remember, Yamuna tells you to cook them in a very low temperature; that’s how I learnt to make gulabjamuns, too. The downside is that they may break if the dough is not perfect and the temperature exactly correct. I noticed that if you fry them, like pakora or vadai, over a moderate to moderately high heat, they stay uncracked. They collapse in syrup if there is a lot of air inside. Unfortunately I’m not expert in gulabjamuns, making them so rarely, and won’t be able to advice you scientifically. They are the kind of sweets that you have to experiment a couple of times to get them right. Make one or two dumplings with different consistencies and fry them over various temperatures to see what works before making a large patch. Gulab Jamuns are the tasty dishes in India. 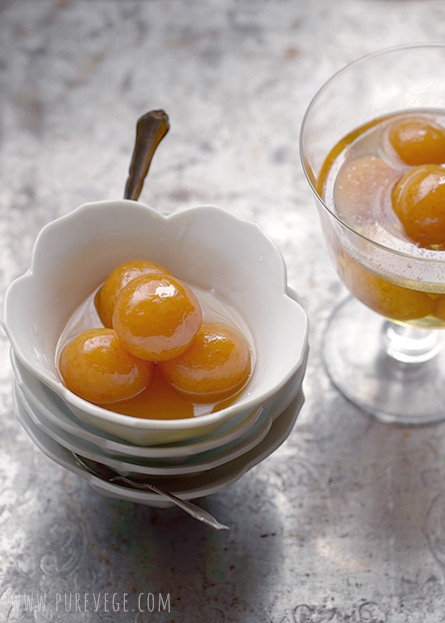 But https://livingfoodz.com/stories/how-to-make-restaurant-style-baked-gulab-jamun-949 website helped me create some great gulab jamuns at home and the secret behind was the medium flame on which the gulab jamuns were cooked. Gulab Jamuns usually get hard because they were fried in high heat and the heat must be kept on Low- Medium while the cooking process.